1853 - A bookstore is started, and the editor of Portage County’s only newspaper—The Wisconsin Pinery-- calls for the establishment of a lending-library for the public. 1862 - A public lending-library is located in the White School, on Water Street (where the Lincoln Center is now, in 2012). 1868 - The Library Association is founded from the Reading Circle, and holds numerous fund-raising events, such as dances, dinners, and bake sales. 1874 - The Library Association opens its first room devoted to shelving, loaning, and receiving books, and to reading. It is upstairs of H.D. McCulloch’s drug store, at 956 Main Street. Members are charged $3.00 per year for borrowing privileges. In 1885 the fee is reduced to $1.00 per year. Ca. 1885 - A free library reading-room is established in Mrs. Parmenter’s Ice Cream Room, on Main Street. 1887 - The Library Association’s collection is moved to the high school, on the north side of Clark Street, east of Church Street, where more than half of the volumes burn in a fire in 1892. 1897 - The first publicly supported free library is established in rooms above Taylor Brothers Drug Store, on the west side of Strongs Avenue, between Main and Clark streets. Miss Frances (Fanny) Catlin is the first paid librarian at $16 per month. She is succeeded in August of 1898 by her sister, Mary (Molly). 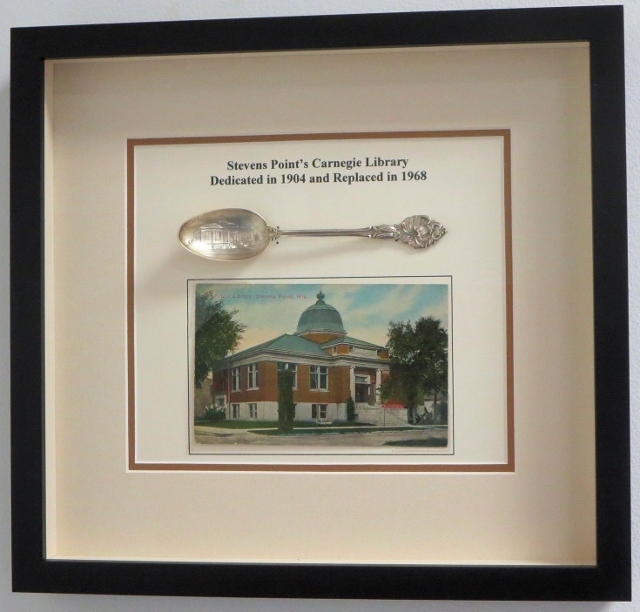 1904 - June 1: The first public-library building, funded with $21,000 from Andrew Carnegie, is dedicated. A typical Carnegie library, with a large dome and Roman columns, it stands at the northeast corner of Clark Street and Strongs Avenue until 1968, when it is razed. Only its bronze front-doors and lamp-posts—added in 1918 with a bequest from Andrew R. Week, a wealthy local lumberman--are salvaged, and are eventually incorporated into the third (1992) public library. 1963-1966 - Amid much public discussion about expanding or replacing the Carnegie library, which no longer fulfills the public’s needs, Charles M. White dies (on December 11, 1963), and leaves $140,000 for an unspecified “project or building that will be beneficial” to the community. City leaders decide to put the money toward a new public-library building, and the search for a suitable location begins. Eventually, the northeast corner of Clark and Church streets is chosen; it is an historic corner, once the site of the city’s first church, the Episcopal Church of the Intercession, built in 1853. 1966-April: Construction begins on the second public-library building. A controversial style of architecture is chosen--“brutalism,” in which the concrete surfaces are left unfinished--and a large, open atrium is the other primary stylistic feature. 1968-May 19: The city’s second public library, named the Charles M. White Public Library, is dedicated. It has 20,000 square feet of space on three levels. 1982 - The Portage County Public Library system is created under Wisconsin State Statutes (Chapter 43: 57 & 43:58), with branch libraries in Almond, Plover, and Rosholt. It is one of the few Consolidated County Libraries in the State. Likewise, it becomes a member of the Wisconsin Valley Library System—one of several multi-county library systems in Wisconsin--with headquarters in Wausau. 1986 - August: City and county officials discuss what to do about a new library building. The White library, 18 years after it opened, is no longer adequate for the county’s needs. Over the next several years,various existing buildings are suggested as suitable sites: the Whiting Hotel, the former Weber Tackle Company building on West Ellis Street, and the former Red Owl building on the South Side. 1990 - July: City officials agree on the site for the third library building (the southeast corner of Main and Third streets), and eventually decide to incorporate the existing old buildings (Kuhl Brothers dry-goods store/Hunters’ Corner and others) into the new structure. Meanwhile, the White library building is sold for about $600,000 to nearby Associated Bank, which converts it to banking facilities and offices. 1991 – The Village of Plover opens its new library on Roosevelt Drive and moves out of the space in Village Municipal Building. 1992 - November 16: The third library building opens. Also named the Charles M. White Memorial Public Library, it costs $4.5 million, and has 45,000 square feet of space on three floors. $800,000 of the money comes from a public fund-raising campaign; $500,000 of that sum goes toward construction, while $300,000 is put toward the acquisition of library materials. By agreement, the city of Stevens Point owns the building, while Portage County operates the library facility. 1994? - The Portage County Public Library moves its affiliation from the Wisconsin Valley Library System to the South Central Library System, with headquarters in Madison. Soon after the library opens, it begins to be equipped with computers. Eventually, by 2012, it has a total of 38 public computers. The second floor has six catalog computers, ten Internet computers, three microfilm reader-printers, two scanners, and two word processors; the first floor has two Internet computers and two catalog computers; and the Youth Services Department (on the bottom floor) has 16 computers: nine for the Internet, four for catalog-searching, and three for game-playing. But continuing its commitment to books, the library has about 150,000 volumes on its three floors. 2009 - October: A Young Adult area opens in the Stevens Point location, created out of part of the store room on the second floor. The area contains booths, couches, chess sets, YA fiction books, and four Internet computers. Also, responding to local effects of the national economic recession, four new Internet computers are installed on the second floor, and are restricted to patrons who are searching or applying for jobs. 2013 - The Village of Rosholt Opens renovated Library space, nearly 3000 sq. ft.